Ammonites were predatory, squidlike creatures that lived inside coil-shaped shells. Like other cephalopods, ammonite had sharp, beaklike jaws inside a ring of tentacles that extended from their shells to snare prey such as small fish and crustaceans. Some ammonites grew mor than 3 feet across. 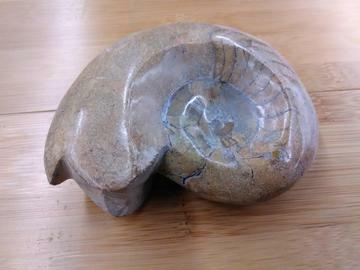 Ammonites constantly built new shell as they grew, but only lived in outer chamber. They scooted through warm, shallow seas by squirting jets of water from their bodies. A thin, tubelike structure called a sipuncle reached into the interior chambers to pump and siphon air and helped them move through water.